Hi ladies, I have stomach issues. Always have, always will. Overshare? The good news is I have my IBS under control as of late (and I’m losing weight!) with the help of a daily smoothie. 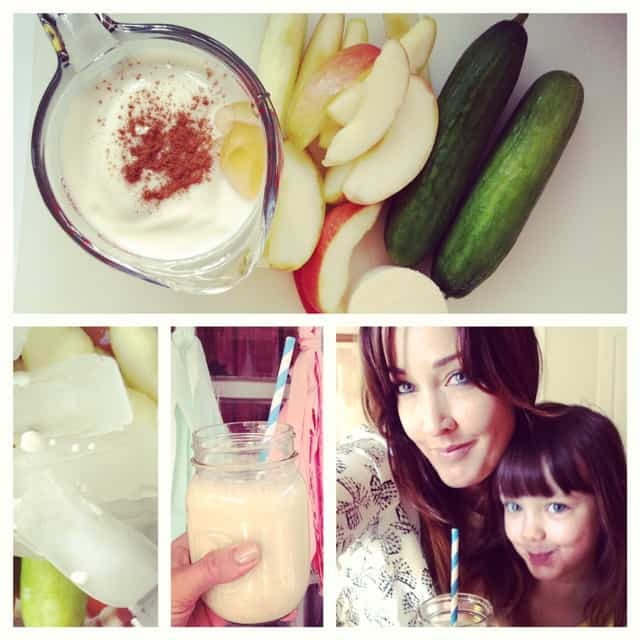 Every morning Scarlet and I whip up a new smoothie, experimenting with vegetables, fruits, and various supplements in our concoctions. Bonus: She has tried more new foods in the past month than in all the previous 58 months of her life combined. Any parent knows that’s a HUGE PLUS. There really is no downside to giving daily smoothie-making a try. 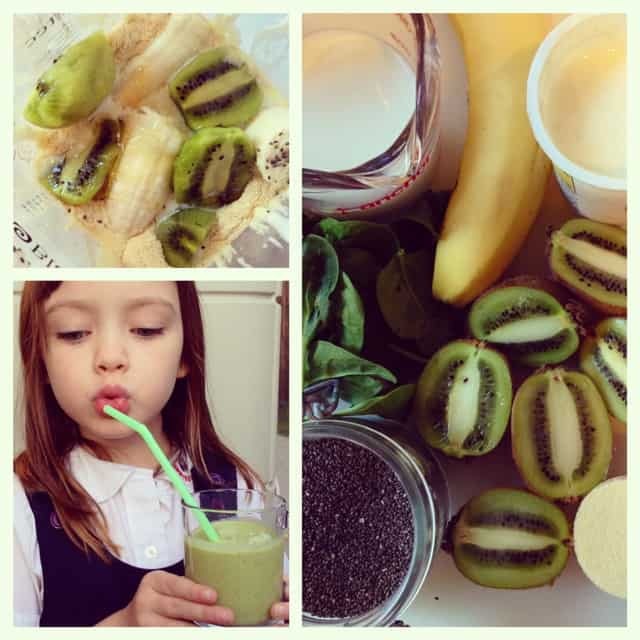 Every day (or thereabouts, occasionally we have some sort of hair-brushing meltdown that gets in the way of our pre-school smoothie time), we make a new smoothie and I post the recipe to Prudent Baby’s Facebook page and to my instagram @prudentjaime. 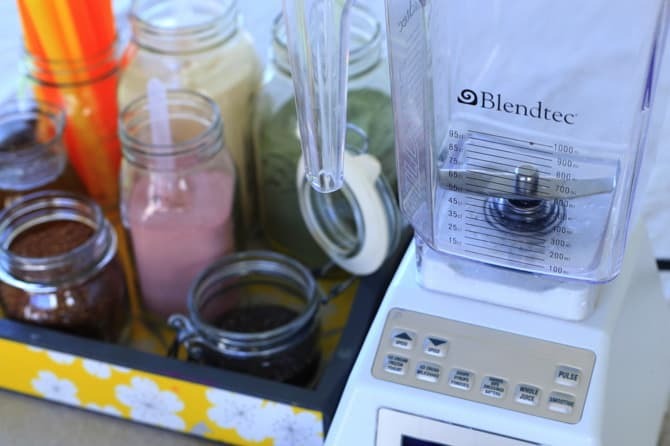 So many prudent mamas have asked so many questions about our set up and process, that I thought I’d use this Friday’s column to give you the scoop on our smoothie station and mad smoothie-making skills. First up is our blender. We use a Blendtec Blender. This thing is awesome, it could pulverize a brick. You don’t need a fancy blender to make smoothies, but it certainly is nice. Also, check out our trick for cleaning your blender here: Prudent Tip: How to Clean Your Blender. It makes the whole process way easier. 1. Boba straws: Boba straws are nice and fat, which makes drinking a smoothie much easier. I can’t stand drinking a smoothie without a straw, but once you throw a banana in there a regular straw just won’t cut it. Boba straws are for drinking those tapioca lumps in boba tea, but they work mega-well for smoothies, and kids like drinking out of colorful straws which is an extra fun plus. 2. Protein powder: I use whey protein powder from Trader Joe’s, but next trip I’m going to pick up their women’s version, which has less calories. Scarlet doesn’t like the texture of protein powder (it can be a little chalky) so we don’t use it often, but sometimes I add it after I serve her a protein-powder free smoothie. 4. Red drink powder: Same deal as green, but it’s red and it’s pretty flavorless to me. It’s full of berry goodness from like 12,000 fruits I can’t bother to re-list here. Scarlet seems to think it’s a giant pixie stick, she’s always sticking her finger in it and licking it off. When I refer to “1 scoop of anti-oxidant boosting powder” in my daily recipes, I am talking about one of these two powders. 5. CHIA SEEDS: This is my single most valued smoothie ingredient. Since I’ve started adding a tablespoon of chia seeds to my diet every morning, things have finally started, umm, moving through my digestive tract. My friend Kathy recommended this to me and I feel like I owe her big time because the change in my normal bloaty-ness has made me drop a pant size. 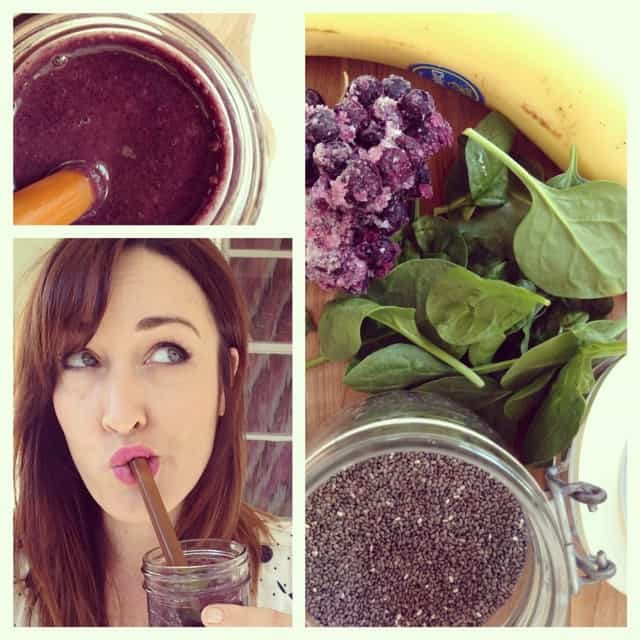 Chia seeds can be soaked before adding to a smoothie, which will make them soft, but I just throw them in. They add a little crunch, kinda like the seeds on the outside of a strawberry. Whichever way you do it, I can’t recommend these enough. 6. Ground flaxseed: I’ve used regular flax seeds, but having them pre-ground is nice for a smoother smoothie. Flax seeds add omega 3 fatty acids, fiber, and lignans, all of which work together to make you healthier in like 10,000 different ways. Coming from a family with a long history of breast cancer, I like to add flax seeds to my diet whenever I can because there is some evidence they help prevent it and other cancers. Who knows if that is true, but it feels good and it’s not hurting us to eat them. And any natural way to add fiber is always a good thing. 7. Fennel tea: Ok, this one is probably a little weird, but I keep it on hand for when Scarlet is not around during smoothie-making (She isn’t into the anise flavor). What I do is crush up some fennel seeds (from the spice section of the grocery store) and boil them in water. I let it reduce down a bit so the tea is concentrated, then strain out the seeds. Add to smoothie, watch gas/bloating/ibs symptoms subside. 8. Ingredients: You can make a smoothie out of pretty much anything, but it helps to think about it like this… Some liquid (water, milk, yogurt), something frozen (either pre-frozen fruit or ice), some fresh fruit, a bit of veggies/leafy things, any supplements you like, and occasionally if necessary a sweetener (it usually isn’t, but if so I like honey) and/or spices (cinnamon or ginger are the ones we use most often). So that’s what I use to make my smoothies. Everyday I post one on instagram @prudentjaime and on Prudent Baby’s Facebook Page with some sort of picture collage like these. 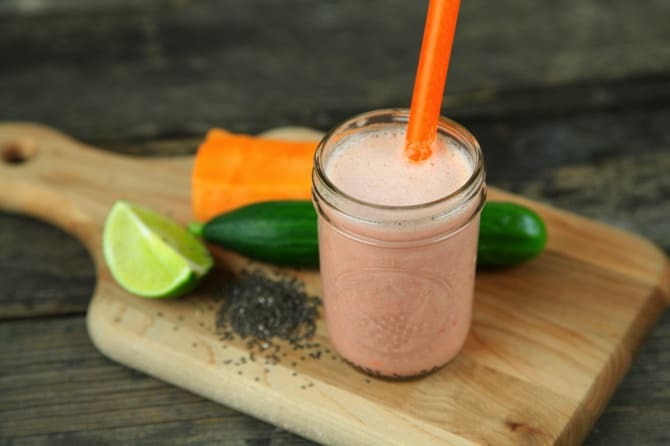 The cantaloupe-cucumber smoothie is one of my favorites. Blend for 45 seconds or until pulverized. These look so yummy! I’ve been toying with the idea of making smoothies for breakfast – such a great way to start with healthy fruits and veggies. I do have a logistical dilemma: I get up an leave very early in the morning, and I don’t want to wake the kiddos with the loud blender. Is there anyway to pre-make these smoothies the night before or do they separate and get weird in the fridge overnight? I make smoothies for my husband every night (and usually there is enough left for me too) and they hold up fine overnight, maybe a quick stir if something has started to settle. i agree with alyssa. i’ve found the ones with fibrous fruit like apples or pears tend to separate more, but a quick shake fixes that up. 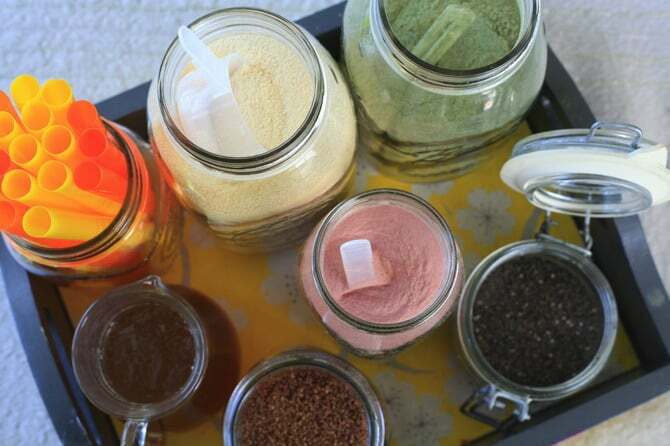 storing them overnight in the fridge in a bottle that you can shake in the morning (with a lid), would make it easy. This post is perfect! 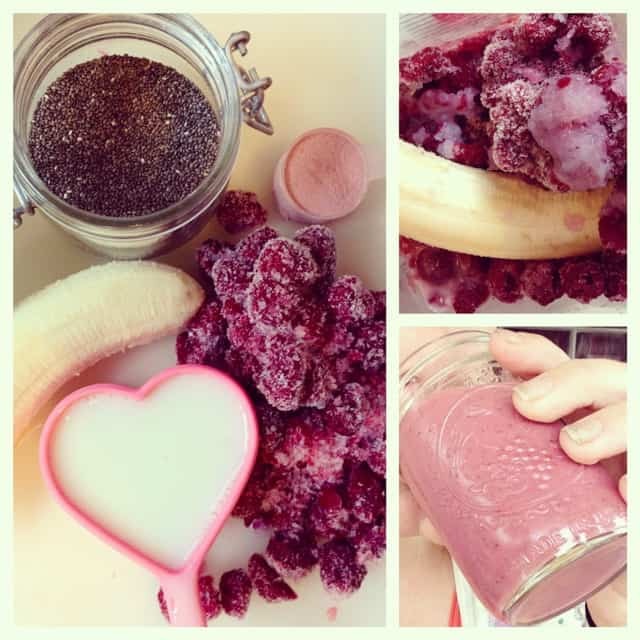 I just started making smoothies for breakfast and needed some ideas as far as what kind to make and supplements to add. I too have IBS so this post is super helpful to me! Thanks for sharing! I make a giant batch of smoothies, then put them uncovered in a small mason jar. Freeze them over night, then put lids o the next day. Usually its enough for a smoothie “treat” that night and a smoothie a day in my sons lunch box! They thaw and get slushy by lunchtime and he eats them with a spoon. You could make them ahead of time then pull one out at night and let it thaw by morning? Thanks for posting these – I think I have IBS and am intrigued. But cantaloupe and cucumber – aren’t those bloat bombs? Now, this is right up my alley! Asking for a blender for my 65th birthday this year- hint, hint! You’ve inspired me to have a smoothie for lunch today! I can’t wait to try one of your homemade ones. These look great! My two year old has had digestive issues for awhile, and her doctor suggested chia seeds. I usually chuck them in when I’m making bread, but the smoothies sound delicious! Hooray for chia seeds! I’m glad that you’re feeling better. And thank YOU for all these smoothie recipes. 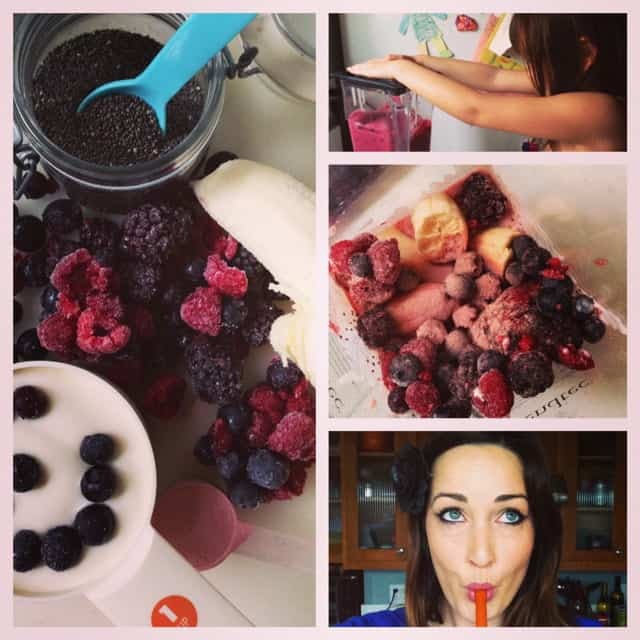 My smoothies to date have been a little blah so thanks for the creative mixings. Where do you buy the Boba straws? Sarah, you can order them on amazon, just click the link in the words “boba straws” above! 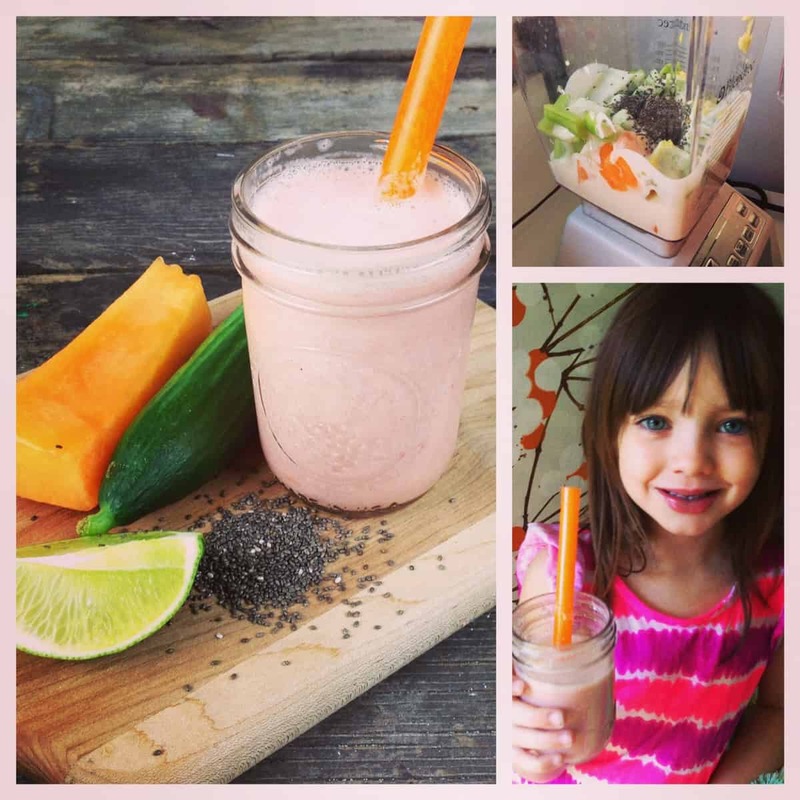 A grateful thank you for the smoothie info & great ideas! I am going organic & am looking for creative/healthy smoothie ideas since I was diagnosed w/ a rare cancer–I’m going to be ok :-). 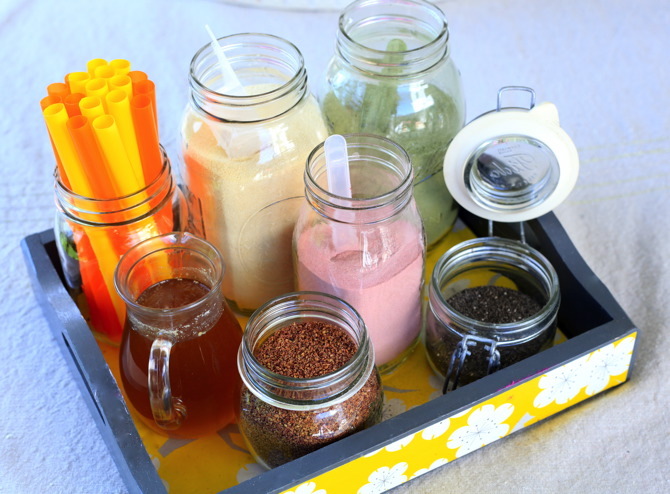 I love how easy & organized your “smoothie tray” set up is…It was daunting for me to figure out what I need to make yummy, healthful smoothies for my kids & myself but you have helped me alot! And heartfelt thanks for your sewing projects…I’ve enjoyed your tutorials, saw you on It’s Sew Easy and enjoy your blog. Thanks for this, Jaime! We tried one of your smoothies this morning and it was a hit. Will the fennel tea keep a while? I have a Magic Bullet and i love it I will be trying out your smoothies.. I have tried all types and also as you go I beieve I will learn more tricks and also combanations to add.. Great job and they look so yummy and healthy. Make sure you always grind your flax and other seeds otherwise they are pointless in a smoothie or any other food. They need to be ground to be able to be digested. If they aren’t ground, they will just go right through your digestive system. Oh, and you must grind them yourself. I know flax in particular goes bad very quickly after it has been ground so it’s best to grind it fresh. I agree on this. I learned about this in my nutrition courses at university. With the fact that the Omega-3 spoil with baking, it made breads with flax seeds a profit gammick. (Sorry for my english). IBS issue made me a headache! My child often feels unwell, we have to go to clinic from time to time, but it is just a temporary solution as the issue come back in a few days later! Which of you who encountered such a problem before? I may not an expert, but based on my experience, my child suffered in IBS issue previously. I treat him with natural home remedies and it worked. Hence, you can give your children a try. I let my child has tried many different natural home remedies, but it’s not working. I ended up by taking him to see a DOC and take medicine, then only his condition was resolved. However, I do not encourage children rely on medication, because it is not good for health. Did you consult a doctor if there IBS how to solve the problem? I believe that doctors can give better advises as they are professional. Asked before. Doc recommended to take medication treatment, but as I said, I don’t want my child rely on medication, natural remedies are preferable. I believe not all the remedies are working, most of them don’t work with every child. Depending on whether your kid can take it or not because the little kid’s stomach is very sensitive. I suggest not to try unknown remedies unless its prescribed by doctors or medical consultants. Just think what a child link the most? It’s formula milk. Could it be that the consumption of formula milk brand is an unsuitable caused tummy issue? The possibility is very high because my boy had been suffering constipation, I’m really distressed! He tried a lot home remedies, but not working at all, then someone suggested that I try to replace milk brand and the result of my boy is really right! Now he seldom constipate, Thanks GOD. Thank you very much for your suggestion. I’ll get more information and reviews for a better formula milk brand. Well, you know what.. you can go to Mamil website to redeem a free trial pack. You will see difference in couple of weeks. For those suffering with IBS I wouldn’t rec using whey in their shakes because dairy is a big trigger for a lot of people with IBS. I was just diagnosed with IBS, with constipation, am trying to lose weight with no results. Just might try these smoothies!! I am looking for my magic bullet on amazon now.